MINNEAPOLIS, MN, April 09, 2013, 10:55 am -- /EPR NETWORK/ -- E-Switch announces a new long life sealed tactile switch, the TL6200. 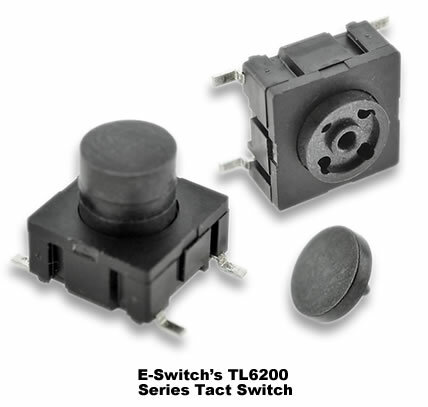 The TL6200 series tact switch offers a long operating life of 10 million cycles and is rated to IP67 standards. This tact switch comes in both SMT (gullwing) and thru hole termination options, and offers multiple actuator lengths. Insulation Resistance: 10 MO Min. About E-Switch In 2009, E-Switch, Inc. acquired Lamb Industries and now offers one of the broadest switch lines available today. E-Switch h as been delivering innovative and quality switches to the electronics, telecom, high tech, instrumentation, industrial, appliance and consumer markets since 1979. Located in Minneapolis, Minnesota, their global reach extends to Europe, Asia and Latin America. Products include Rocker, Toggle, Slide, Tact, Pushbutton, Dip, Rotary, Keylock, Snap Action, Power, illuminated switches, and more. E-Switch has local reps, distributors, engineers and account managers on hand to provide specifying assistance and quick response to requests, along with a top notch sampling and cross-referencing program. E-Switch's online catalogs include complete specifications, drawings and schematics.